Did You Know it’s Not Just About the Money! Business owners pay for software and systems and apps they need for their business. They also pay for courses and coaches and costs to attend business-related events. But when it comes to hiring a support person … and here I’m pointedly referring to a virtual support specialist — or as we are, online marketing support specialists; business owners seem to have a difficult time spending the money — which is probably due to their not understanding the value of a support specialist, and what it takes to be a good one. 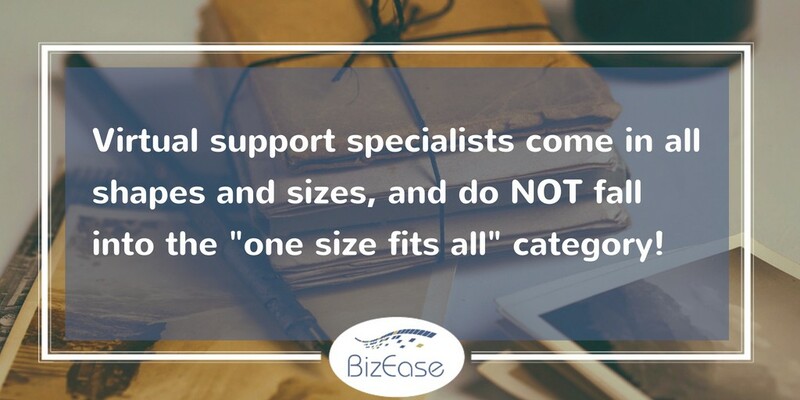 Virtual Support Specialists come in all shapes and sizes, and do NOT fall into the “one size fits all” category! And no, I’m not talking about height or weight here … I’m talking about skills, expertise, years in business, reliability and all of the other things you consider when hiring a business coach or any other business owner to provide a service. When you get hung up on rates … as many business owners do, you limit your options tremendously. Just because someone charges a lower rate doesn’t mean you’re getting a better deal. If you do your due diligence when searching for the perfect fit, you might find that a virtual support specialist with a higher rate (sometimes much higher) can do the work in half the time it would take someone with a lower rate to do because they have more experience, more skill and knowledge regarding a specific task or project, and are just more efficient. Virtual support specialists are not the sum total of their rates! So, when you get to the point you need to hire a virtual support specialist, don’t just look at the rate they charge. Take a good look at their website, how long they’ve been in business, the services they offer, the testimonials on their website, their blog posts, their social media channels. Take a look at everything they do to get a good overview of who they are and what they do. Don’t be afraid to ask for references. Don’t ask for a resume because, like any other virtual business owner, we are business owners and not employees. Our websites are our resumes. Would you ask your accountant for a resume? No. But do ask for references. If a virtual support specialist refuses to give you a reference, there might be a reason why, so he/she might not be a good choice. And then, after you’ve done all of your due diligence, before considering their rates; have a phone conversation with them to see if they are a good fit. Do your due diligence when choosing a virtual support specialist, just as you would any other service provider. You might end up going with a virtual support specialist with a lower rate. But then, you might also choose one with a higher rate because you know in the end, it’s a better deal. Just do your due diligence!